Lyle: Hendrix - possibly the number 1 rock guitar legend of all time. Even though his career was brief, he turned the music world upside down with his music and live performances. Hendrix is my favorite all-time rock guitarist because he made his own rules when creating music and tones from his guitar. He used a Strat and a Marshall amp, and many pedal effects, mainly a wha-wha, fuzz/distortion pedal, and a Uni-Vibe, which simulated a rotating speaker like the Leslie, used on organs. So much is written about his life and his techniques, I suggest you read a couple books that I have enjoyed: Setting the Record Straight by John McDermott and Eddie Kramer, Are You Experienced by Noel Redding and Carol Appleby. 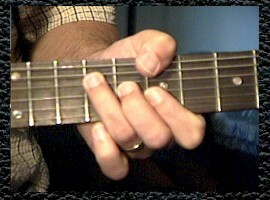 Lyle: Use your thumb to cover the 2nd fret of the big string. Lyle: Notice I'm using a clean sound on my guitar for these rhythm riffs. I'm using a single coil pickup, the middle one on my strat style guitar. opdev: What key is this song in? Lyle: Remember to use your thumb for the bass note! Lyle: You've just learned a bunch of cool rhythm techniques Hendrix liked to use, now you'll learn a couple solos in his style. Lyle: You can click the loop button above the tab so you can jam along to it. 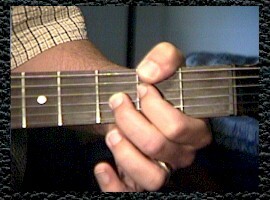 Notice the very basic minor pentatonic shape that climbs the neck, following each chord. I'm also using a slight distortion and heavy flanger effect to counter the clean rhythm sound. Lyle: The second solo in the lesson sample is against the B to A chords - rhythm riff 2. The scale of choice here is perhaps the B major pentatonic. Lyle: As you bend up the 2nd string 1 1/2 steps, you grab the 3rd string on the way up, then pluck the 3rd string as you begin to release the bend.